Your best diet plan for weight loss should not focus on calories. Calories are not the culprit behind weight gain. What is? HORMONE IMBALANCE. Your best diet, therefore, has to focus on restoring hormone balance. Very few weight loss diet plans do. If you really want to know how to lose weight effectively, here is what to look for in a weight loss diet plan that really works. In simple terms, hormones are biochemical signals. They are made in one part of the body and sent to another. They are ‘accepted’ at their target locations by special protein receptors. Once a hormone gets properly attached to its receptor, it directs a specific metabolic change. We have hundreds of hormones that fit this pattern. The most well-known hormones are steroids, such as estrogen and testosterone. Most of the hormones that are important for weight management and fat metabolism, though, are proteins. Of these, two stand out for their broad impact on metabolism: insulin and leptin. Insulin and leptin share a crucial feature. Their entire signaling pathways stop working when their receptors become chronically overexposed to the hormone. This is what we call hormone resistance. Insulin resistance and leptin resistance undermine your health in many ways. Diabetes and obesity are two of the most obvious consequences. The clear question is, how can you get these two hormone pathways back into working order once they get off track? These steps will assure your long-term success for weight management and many other aspects of good health. The hCG diet protocol has been the most well-known hormone-based weight loss program since 1950. Dr. A.T.W. Simeons, who created this protocol, first suggested that hCG acts on the part of the brain called the hypothalamus. This almond-sized region of the brain has many functions, including controlling food intake and increasing energy output from the metabolism of fat. These activities partially mimic those of leptin, which also acts on the hypothalamus. The hCG diet protocol is a booster rocket for hormone-driven weight loss. The combination of ultra-low levels of hCG with food restrictions seems to quickly reset the hypothalamus for fat-burning mode. The main food restrictions include so-called ‘calorie restriction’ (i.e., a max of 500 calories per day) and the consumption of very little fat. Reducing exposure to fat is so critical that even oil-based cosmetics and soaps can disrupt the hCG signaling pathway. Closely following the recommended food list while taking hCG drives an average loss of a half to a full pound every day. See HCG Diet Basics for an overview of the protocol. Since this is a hormone-driven protocol, it can also lead to resistance. The maximum length of the protocol is 45 days before the hCG stops working. Injections, as opposed to oral forms, of hCG hasten the development of resistance, which is why Dr. Simeons advocated its use for 6 days a week with one day off for the length of the protocol. Oral forms of hCG can be used every day, though. 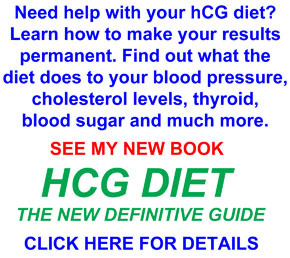 For the most complete modern guide to the protocol, with the latest updates, see my book, HCG DIET – THE NEW DEFINITIVE GUIDE. It the most detailed source of information on how to get the most out of the hCG diet protocol that I know of. Focus on weight loss is misleading. The key is fat loss. This is where hormone-driven weight loss is superior to all diets that focus mainly on food. Food-based weight loss may or may not cause a drop in pounds. Results are easy to see on your bathroom scale. The hCG protocol, though, directs the metabolism of excess fat. An ordinary bathroom scale will not measure fat loss. Fortunately, measuring fat loss is simple with inexpensive bioimpedance devices such as the Omron Fat Loss Monitor. This is how I measured my own successes on the hCG protocol, which I recounted in an earlier post, here: Personal hCG Experiment – 2015. The main point is that, while losing weight by itself is satisfying, losing fat is the key to getting trim. Insulin (from Latin insula, island) is a peptide hormone produced by beta cells of the pancreatic islets, and it is considered to be the main anabolic hormone of the body. It regulates the metabolism of carbohydrates, fats and protein by promoting the absorption of, especially, glucose from the blood into liver, fat and skeletal muscle cells. In other words, it builds tissue (i.e., anabolic) by driving blood sugar (glucose) into different kinds of cells. The development of insulin resistance underlies type 2 diabetes and metabolic syndrome (including obesity). Reversing insulin resistance – i.e., resetting the insulin signaling pathway – is crucial for overcoming such disorders. Depending on how far along your insulin resistance has developed, resetting your insulin pathway can even reverse type 2 diabetes. Chronic overexposure to blood glucose drives insulin resistance. The most common sources of blood glucose are dietary carbohydrates. This simple strategy contradicts mainstream medical advice. I explained the problem in a post on my natural health blog, here: Doctors Give Amazingly Bad Advice for Diabetics – and Everyone Else. The bottom line is that your insulin signaling pathway will never work right in an environment of chronic overexposure to blood glucose. Certain drugs and supplements will also help control FBG and restore insulin function. Before you look into any such treatment, I’ll just say that my favorite (and most effective) strategy is described in another post in my natural health blog, here: Health Problems Reversed by Intermittent Fasting. My philosophy is that your body has all the tools you need for a long and healthy life. All you need to do is let them do their work for you. Intermittent fasting clears the way for that to happen. Leptin is a relatively new hormone on the health scene. It wasn’t discovered until 1994. Now it is the topic of a best-selling book, Mastering Leptin (3rd ed.) by Byron J. Richards and Mary Guignon Richards (available on Amazon). Leptin is often referred to the Master Hormone, and rightly so. It influences the function of many other hormones, including insulin. When your leptin signaling pathway works well, you will be slim and healthy. When it doesn’t, you will be overweight and unhealthy. Indeed, the simplest assay for leptin resistance is the mirror test: Look at yourself in the mirror; the more excess fat you carry, the more leptin resistant you are. Leptin injections, unlike insulin injections, fail to activate the signaling pathway. Adding more hormone when there is an ever increasing level of hormone resistance is a recipe for failure. SIDENOTE: This failed strategy is something that all type 2 diabetics who use insulin should be aware of. At its heart, leptin signaling drives the metabolism of fat. Fat accumulates when leptin signaling fails. Reversing leptin resistance is even more important than reversing insulin resistance. They go hand in hand. However, restoring insulin function depends on restoring leptin function, not vice versa. Multiple steps are important for resetting your leptin pathway. Each requires a bit of explanation. Rather than providing that in this post, I will just refer you to the absolutely best source of information on this topic that I have ever found. It is My Leptin Prescription by Dr. Jack Kruse. Dr. Kruse offers a relatively simple set of recommendations that will easily reset this crucial hormone pathway. Now get going and enjoy your new and healthy slimming experience!